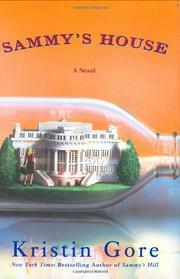 In this jokey, sometimes juicy romance-and-politics comedy, the eponymous heroine, who was a senatorial aide in Gore’s first novel (Sammy’s Hill, 2004), finds herself working in a scandal-ridden White House, territory Al’s daughter obviously knows well. Nerdy but pretty Sammy comes to the White House when her boss, the admirable Senator Gary, is elected vice president. She works on health-care issues for the demanding but good-humored (and yes, fatherly) Gary, while indulging in her own mild hypochondria and waiting for her reporter boyfriend Charlie to propose. In the face of petty pranks and small exposés perpetrated against the White House by opposition members who call themselves the Exterminators, Sammy remains unperturbed, proud to be an idealistic believer in the new administration. She is therefore deeply shaken when she discovers that President Wye, a self-proclaimed reformed drinker, spikes his diet sodas with whiskey. Then, on a trip to India to work out a trade deal for low-cost pharmaceuticals, Sammy and V.P. Gary find themselves acquiescing to Wye’s request to arrange undercover shipments of a still-experimental drug to treat Wye’s Alzheimer’s-ridden father. Soon after the elder Wye dies, leaving behind an illegitimate presidential half-brother fathered in an assisted-living facility, Sammy witnesses the president being dosed with the experimental Indian drug to counteract his alcoholism. It isn’t long before the Exterminators get wind of the real scandal brewing. While the White House operatives scurry to find leakers, Wye denies the drinking. Not only is Sammy distraught at the state of the free world, but her work is taking its toll on her love life. To the author’s credit, no one—not even Sammy, Charlie or the basically ethical and ultimately heroic Vice President Gary—is without guilt, although love and honor conquer all. Despite a few wicked sparks (the reality show starring the ex-president is priceless), Gore’s satire is more affectionate than biting.